Twins Tix Disaster: Word of Mouth Spreads Bad News Fast. At least my time was not wasted, I am completely caught up with correcting my students’ papers and exams. 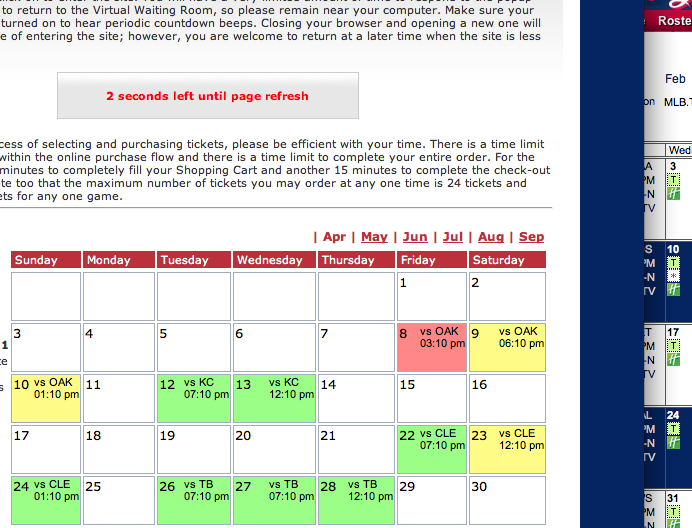 Like many Twins fans, I waited patiently to get to the front of the line in the virtual waiting room. At first I thought that was pretty cool, I could see myself moving up, but mysteriously, I would suddenly jump back a few places. I was in two lines — one on Safari and one on Foxfire, both on Macs. Pretty quickly I was first in line on Firefox, and with great hope I pressed continue. Uh oh, like thousands of other fans I went to the white screen of death — i.e. a blank screen that is still there. Joyfully, I kept moving up on Safari and then suddenly, I was in! I was ready to shop. Unfortunately that system was overloaded, too. I had to continually re-enter my ticket requests. After awhile, I had a shopping cart full of fun. Maybe not the games or days I wanted to go to, but still games! I entered my info, my credit card number, declined ticket insurance, and pressed purchase. I was back in line. My ticket purchases erased. Gone for good. How do I know this? Easy! #Twins on Twitter is full of very, very angry and not so polite former, current and never-again Twins fans. The angst was big enough that the Star Tribune eventually picked the story up: Server Problems Plague the Twins by Abby Simmons. As of 4:30 today, the story had been Tweeted just 13 times. Nobody must have cared enough to share the news. Why? They are all complaining on Twitter and Facebook. I have to say, it’s nice they apologized, right there on Facebook. Somebody’s minding the store, after all. But it’s not enough. Public Relations Nightmare, but just saying that makes me feel guilty because I’m a whole lot luckier than anyone in Japan right now. Will the Twins recover? Of course. We Minnesotans are a fairly nice bunch of people, we forgive, we forget. Will I go to a game this summer? Not likely. Too bad the MLB didn’t invest in their technology. After all, our rapid devotion for all things Twins and the M & M Boys is pretty well known, as are server overloads–SXSW Tweets crashed Twitter just last night. Not so sure I’m as understanding! This kind of thing reminds me of the eBay case we just recently studied in my Advance Management class. Same issue was happening to online bidders who were getting bumped off due to system overload issues. Twins should have been prepared (ESPECIALLY after last year) and an apology means nothing to someone who stood in a virual line last year and AGAIN this year only to lose once more. Sad and ridiculous! Should never of happened. The Twins are not unlike many other businesses who spend megabucks on marketing but then are not prepared to handle all the customers that marketing brings in. A business’ website is as important to their success as a brick-n-mortar store is, and online customer expectations are high. They need to invest in it as they would their store, and perhaps even more depending on the type of business and products sold. Too bad so many businesses and even the Twins organization learn this lesson too late. A virtual nightmare! I wasn’t in line online but can sympathize with you and everyone patiently waiting their turn to purchase their own piece of summer fun in the sun. With all of the hype since the new Twins outdoor stadium, Target Field, was introuduced to the public and die hard fans last year it is definately discouraging to learn about this incident. For the Twins sake, I hope the fans don’t give up on them, especially since their game coverage on network television has been limited to 5 games this season. Fortunately, I have access to cable television and will be able to watch the other games but not all fans have this opportunity.